"Droids don’t pull people’s arms out of their sockets when they lose. Wookiees are known to do that." If you've angered the Wookiee and it's coming after you, you might see the Wookiee as a worrisome force of destruction. Its low growl, towering form, obvious strength, and renowned ferocity may have you questioning your life decisions—even as you look for ways to extend your suddenly fragile lifespan. If, however, the Wookiee is your ally, and it's lunging into a pack of Stormtroopers who, much to their surprise, find themselves tossed about like rag dolls, you might view the Wookiee's rage from an entirely different perspective. You may see it as the manifestation of its fierce loyalty and its bravery—its unrelenting nobility of spirit. No matter how you view a raging Wookiee, though, you'll have your chance to get a better look at one during 2018's third season of Organized Play for Star Wars™: Imperial Assault! A celebration of the Imperial Assault skirmish game, Imperial Assault Organized Play helps you find other players, enjoy more of the game's tactical combats, and see new and interesting strategies. Better yet, your participation in Organized Play events puts you in contention for a whole host of custom prizes, including an extended art version of the Wookiee Avenger skirmish card! The 2018 Season Three Tournament Kit for Star Wars: Imperial Assault comes with seventeen Core Prize Cards, three Elite Prize Cards, and two Elite Prize Sets. One of these Core Prize Cards and one Elite Prize Card are the event organizer's to keep or distribute at their discretion, but the other prizes are all up for grabs, awarded to those commanders who can best balance their pursuit of objective points with their destruction of enemy forces. Whether you enjoy your skirmish battles in an Entanglement Tournament or over the course of an Imperial Assault league, you can claim one of the Core Prize Cards for finishing among the Top 16 participants, and if you finish among the Top 4 participants, you'll be able to choose one of the Elite Prize Cards or Elite Prize Sets. 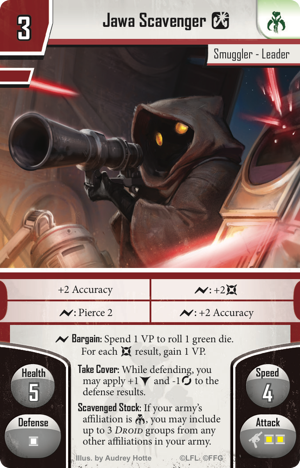 The Top 16 participants in each Season Three 2018 Entanglement Tournament or Imperial Assault league receive a double-sided, alternate art version of the popular Jawa Scavenger unit. One side features the standard Jawa Scavenger while the other features the elite version, which allows your Mercenary army to recruit up to three Droid groups from any other affiliations. Both sides boast an action-packed illustration by Audrey Hotte, who depicts the yellow-eyed smuggler returning enemy fire from the cover it has taken behind a pile of scrap. Battle your way into the Top 4 of your Entanglement Touranment or Imperial Assault league, and you'll earn the chance to claim an Elite Prize Card or Elite Prize Set. If you choose the Elite Prize Card, you'll be able to bring Chewbacca to your games, bigger and bolder than ever! 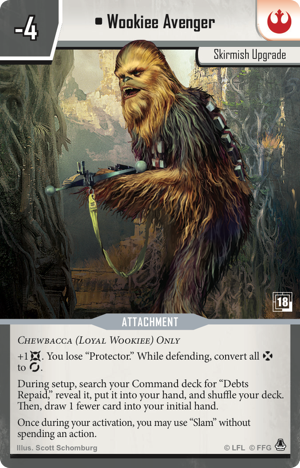 This extended-art version of the Wookiee Avenger skirmish upgrade features all the same game information as the version from the Heart of the Empire campaign expansion, but it boasts a version of Chewbacca that can no longer be contained by the standard art frame. When Heart of the Empire was released, players everywhere were exicted for its skirmish upgrades because they meant we'd see more of Darth Vader, Han Solo, and Chewbacca. And now that we've seen them feature on more and more tables, this upgrade allows you to get an even better look at everyone's favorite Wookiee. 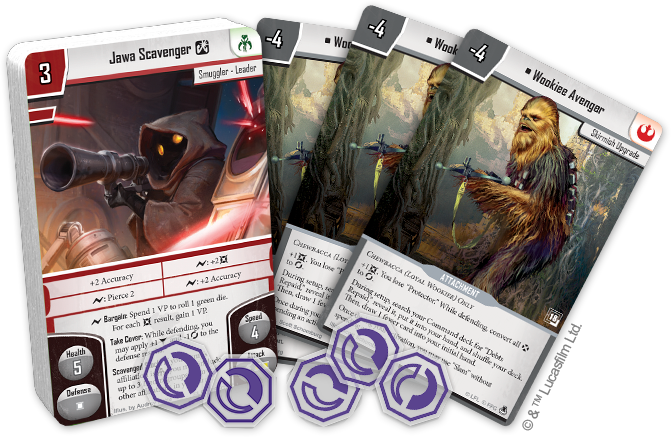 Alternatively, if you make the Top 4 and don't claim the Wookiee Avenger Elite Prize Card, you can upgrade your collection of Imperial Assault tokens with the five Weaken tokens featured in the Season Three 2018 Elite Prize Set. These acrylic tokens feature purple paint atop a frosted white base and hinder the attack and defense of any figure that suffers them—perfect for anytime you find yourself on the wrong side of the raging Wookiee! Before you send your army into the thick of combat, you want to give it every advantage—including the enhanced cosmetic appeal provided by the custom cards and tokens in the 2018 Season Three Tournament Kit. Jawa Scavengers, raging Wookiees, and stunning Weaken tokens—it's all in there, and it's all yours to win. So talk to your favorite local retailer today to find out how you can get involved with Imperial Assault Organized Play!